The company has prepared to launch its Green By Design mandate, which puts the philosophy of sustainability at the core of its approach to all existing commercial and future commercial developments investments, with a Sustainability Manager soon to be appointed to steer its green direction. This mandate specifies 10 guiding principles including a place and people focused bottom line as well as a requirement for innovation at all levels of the business, including administration staff. The Green By Design philosophy also includes the desire to continually seek out and adopt emerging technology and materials that boost the sustainable performance of new and existing commercial buildings. Cbus Property chief executive Adrian Pozzo said the company realised it had an obligation to future generations to get sustainable development right. “We understand the enormous impact that sustainable design, construction and building management has on improving the health and well-being of those who work or live in or around our investments,” he said. Cbus Property has already sought to exceed industry standards by pursuing Australian and international accreditations in green development and well-being, which includes the NABERs, Green Star and WELL ratings systems. The company’s 720 Bourke Street building in Melbourne (pictured) achieved a six-star Green Star rating along with its widely acclaimed 171 Collins St building in Melbourne that has collected over 20 national and international awards. 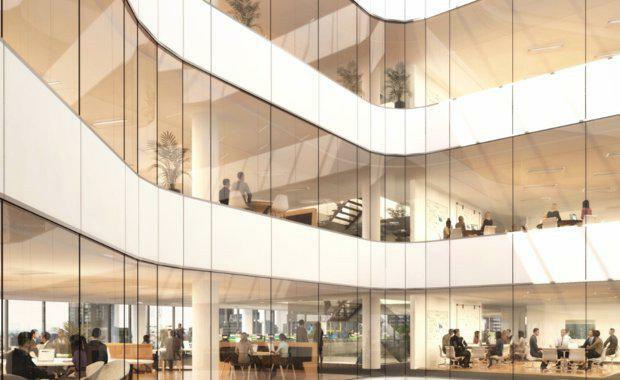 Victoria and Western Australia currently lead the nation in sustainable office space with 34 per cent of all offices achieving Green Star certification from the Green Building Council Australia. Australia’s 1,462 Green Star certified buildings produce 62 per cent less greenhouse gas emissions than average Australian buildings and use 66 per cent less electricity, 51 per cent less potable water and recycle 96 per cent of construction and demolition waste, according to the Green Building Council. “We as an industry have to adopt a stronger focus on the future and do more to improve the built environment of our growing cities," Pozzo said. “With more than half of the world’s population now living in cities, Australia has an opportunity to lead the world in creating urban environments that better the lives of all inhabitants."